Mornings can be brutal, if you’re not prepared. There have been mornings in my household where no one will get dressed, breakfast becomes a fight, and the home gets destroyed as everyone is running around looking to gather all the items they need for the day. It happens sometimes, and it always makes for a terrible way to start the day. To skip all the chaos, we’ve found a lot of back to school hacks our family has implemented that now make our mornings (mostly) stress-free! I won’t say our mornings are always perfect, but most mornings we have time to spare! 1. 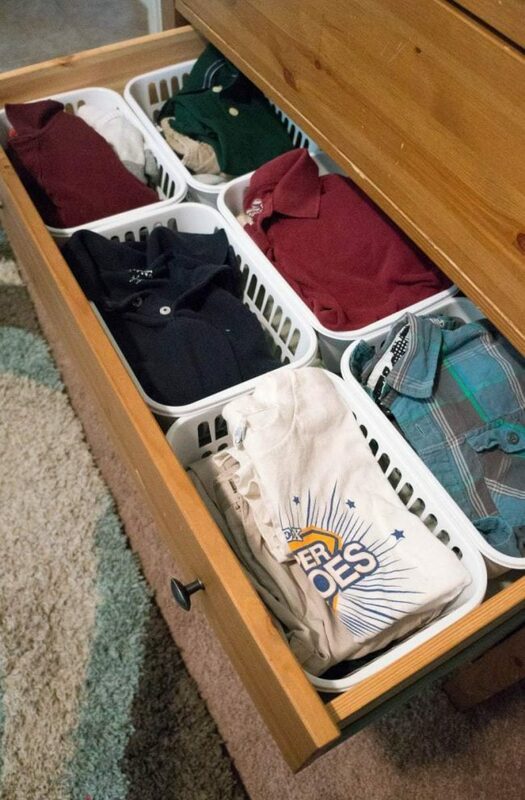 School Clothes Bins – When laundry day rolls around, sort out clothes for each school day that week, and church too if that’s a struggle in your home. We used 6 very inexpensive plastic bins that fit perfectly in my son’s drawer. Each bin has a uniform top, bottom, pair of socks, and underwear ready to go. In the morning, my son can pick which combo he wants to wear by selecting a basket, and everything matches and is ready to go. He has a special set for Friday’s with a school spirit shirt and his Sunday clothes laid out. Saturday is his “you pick” day! The great thing about this set-up is it doesn’t take any extra space, it’s all neatly tucked inside of his drawer. 2. 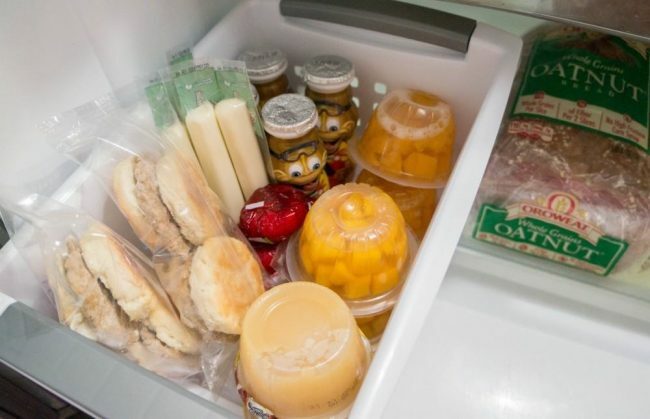 Ready-to-go Snacks – Arrange a variety of pre-portioned snacks to be ready to grab and go for your children. You can purchase already individually sized, or grab a handful of zippered baggies and bag them yourself. Restock the snack tub once a week to always have a good variety available. Now, you won’t have to think about their snack every day. Let your kids pick out a snack from your go-to tub and everyone is happy. 3. No-Stress Breakfast Choices – Plan out some easy breakfast options with your kids that they like and can grab and get ready in the morning without needing your help. Odom’s Tennessee Pride has a variety of really easy grab-cook-and-go options like their Sausage & Buttermilk Biscuits snack sized sandwiches. My kids LOVE these and they take under a minute to cook and they are left feeling full until lunch! 4. Shoe Bucket – Have a spot dedicated to shoes in your home. Whether that’s a shoe collection by the front door, cute little cubbies, or even a shelf in their closet, find a spot and stick to it. 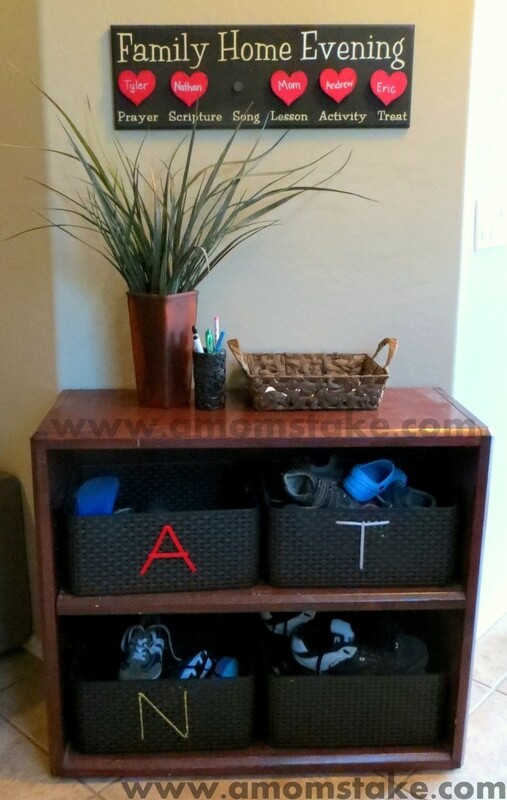 We re-purposed a bookshelf to create a diy shoe shelf with some durable plastic tubs to corral each child’s shoes, and keep them out of the front doorway. 5. Give Them a Schedule – Give your children clear directions in the morning by outlining what things need to happen each morning. 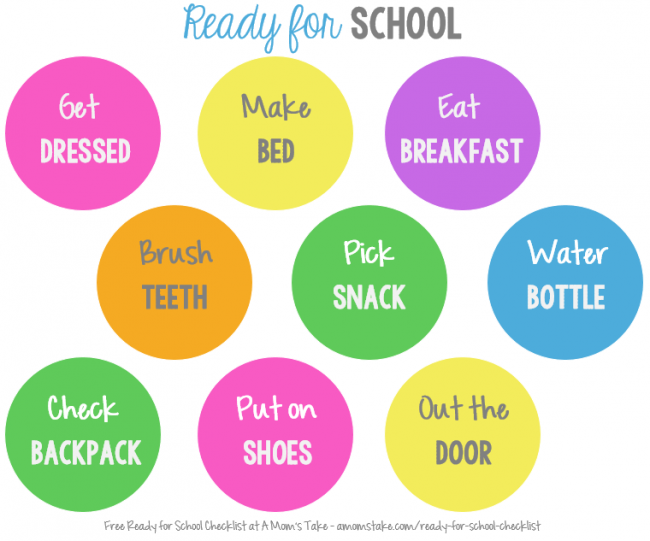 You can print off our Ready for School Printable chart that kids can use to mark off all the things they have completed. This can help keep the kids focused and on-task. 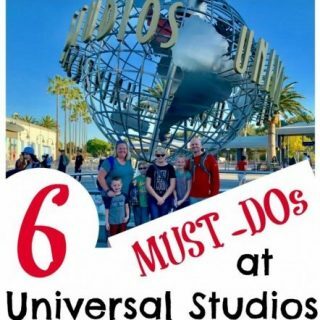 My boys know once they’ve finished all the 9 items on the chart, they are ready to go and we can leave early or they can spend a few minutes doing something they enjoy. 6. Backpack Bucket in the Car – Use a tub as a landing spot for everything headed to school as soon as they hop into the car. 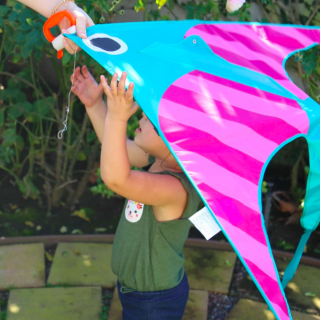 This will keep their water bottle, backpack, school projects, and anything else they are toting along with them contained and ready to take with them when they hop out of the car door. 7. 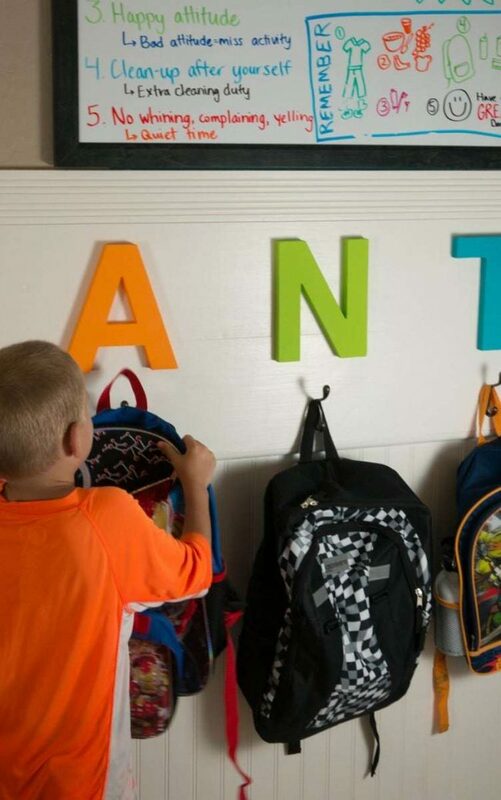 Backpack Station – Give your kids a clear, defined space to hang up their backpacks when they walk through the door. This will make it so much easier to find their packs in the morning and keep them up off the floor! 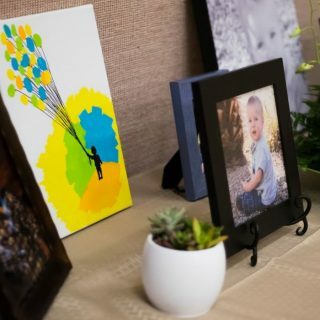 If you can personalize this space with their name or initial, even better! 8. Homework/Folder Dropbox – Create a “mailbox” system like your children are used to using in the classroom where they can drop their homework, go folder, papers, or anything else you need to see. This one spot can corral all the paperwork so it doesn’t end up all over your counter and gives both you and your children a dedicated spot to find exactly what you are looking for. Parents can spend a bit of time sorting through the paperwork, filing what papers you want to keep, signing any important sheets, and reviewing work completed. 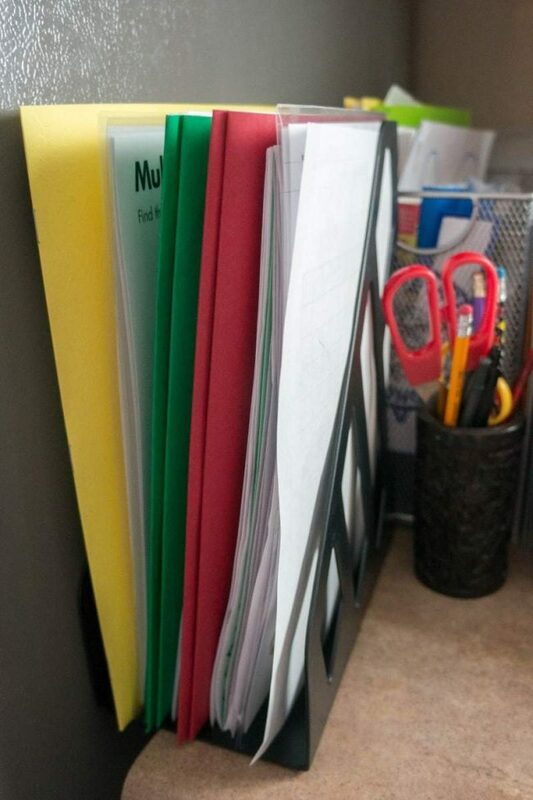 When homework time rolls around, you can be organized with what needs to be completed and then have your children return their folders and important papers back to their backpacks. 9. After-school Snack – Kids always seem to walk through the door and announce they are “starving”. Have a variety of choices ready for munching so you don’t have the kids standing aimlessly looking into the fridge for a solution. 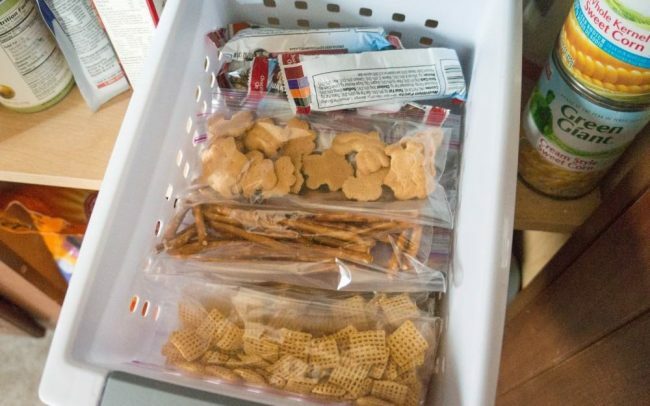 We have a snack tub in the fridge with choices and my boys know they can pick any one snack after school either from the school snack bucket or the fridge snack choices. 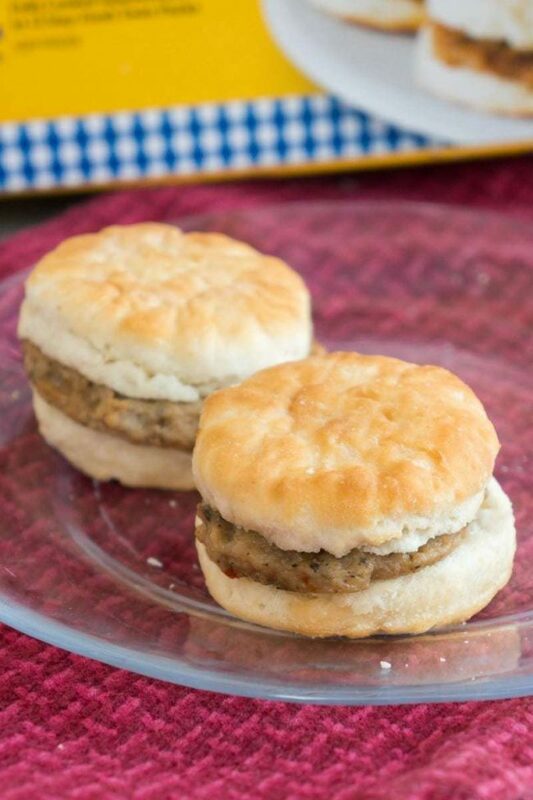 You can even stash a few Sausage & Buttermilk Biscuit snack sandwiches in the fridge (can be stored thawed in the fridge for up to 3 days). They are a prefect, filling after school snack. 10. 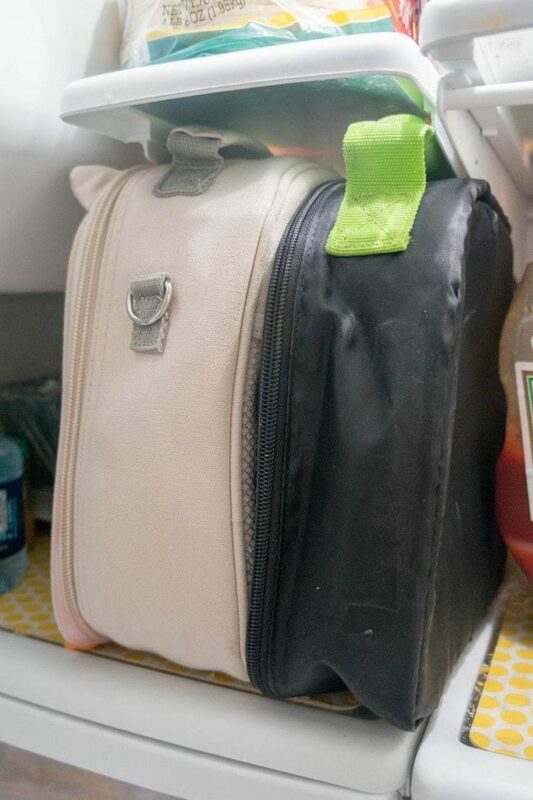 Water Bottle in the Fridge – Give your kids the responsibility of taking their water bottles right from their backpack as they walk in the door to the fridge. They can dump out the day’s water, rinse out their water bottle, and then refill it again so it’s ready for the next day. 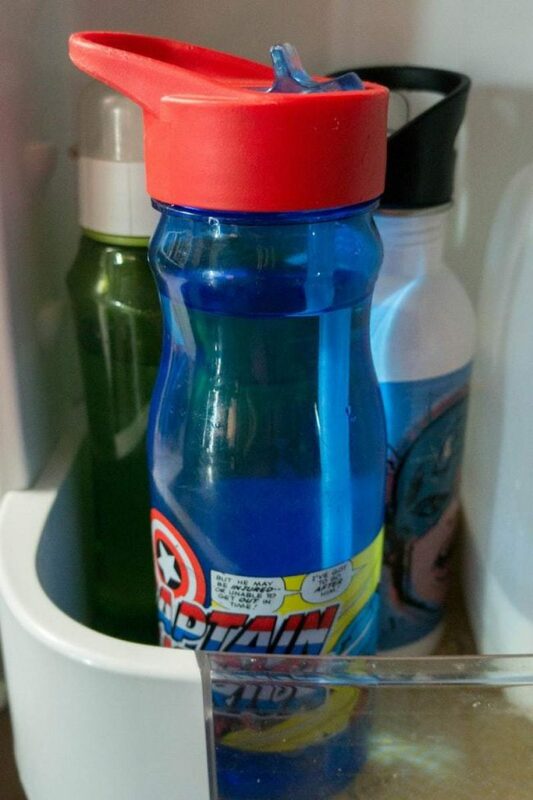 Then, store the water bottles front and center in the fridge so they don’t get misplaced or forgotten. 11. Prepare School Lunches – If your family prefers to pack a school lunch, assemble everything you can the night before and have it in the fridge ready to go. Your child can help pick out what goes inside by choosing an option from your already ready fridge and pantry snack tubs. Then, add a drink and a main entree and lunch is ready! You can freeze PB&J sandwiches to make them ready to grab-and-go in the morning. 12. Shower/Bath Night Before – My boys always come home sweaty and dirty after a day of play at school. 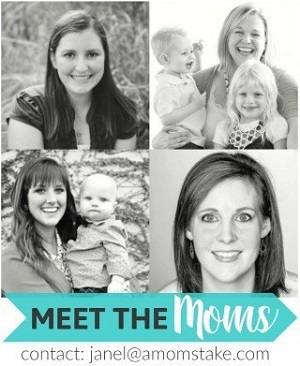 It’s so much easier to get the kids to take a shower or a bath, whichever they prefer, in the evening. It saves so much time in the morning and ensures they are clean and ready for a new school day. Plus, as a bonus their sheets stay clean longer. 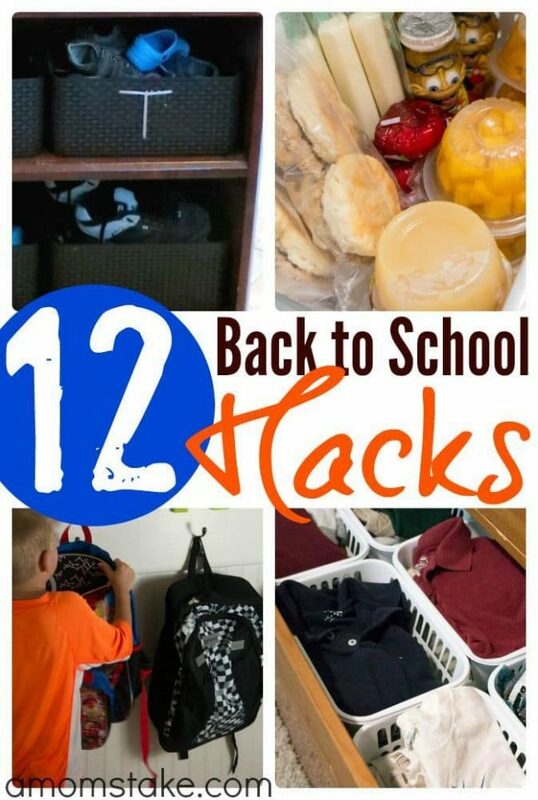 Even adding just one or two of these easy back to school hacks to your routine can save you a lot of time (and stress) in the morning. The biggest time savers for our family is having their school clothes all ready at the beginning of the week (no shuffling around looking for clean clothes) and simplifying our breakfast routine. There is nothing that’s quite a time sap as those two necessary morning activities. Our whole family really loves Odom’s Tennessee Pride breakfast sandwiches. They are filling, tasty, and so incredibly fast! Best of all, if we are really in a pinch, they can come right into the car – no dishes required. I really appreciate that they are full of protein so my kids stay feeling full, longer, which is really important for their busy school day. Does your family use any school hacks? The ready to go snack bags all organized is a work of genius and i’m totally stealing that idea! The clothes bins with the outfits is an excellent idea!! Stealing. Also, we designated a DAY for each child. That day that child got to do everything like sit in the front seat, pick the TV channels, but they also had to clear the table and do the dishes. We do many of these things ourselves, if not it is too hectic and unorganized! 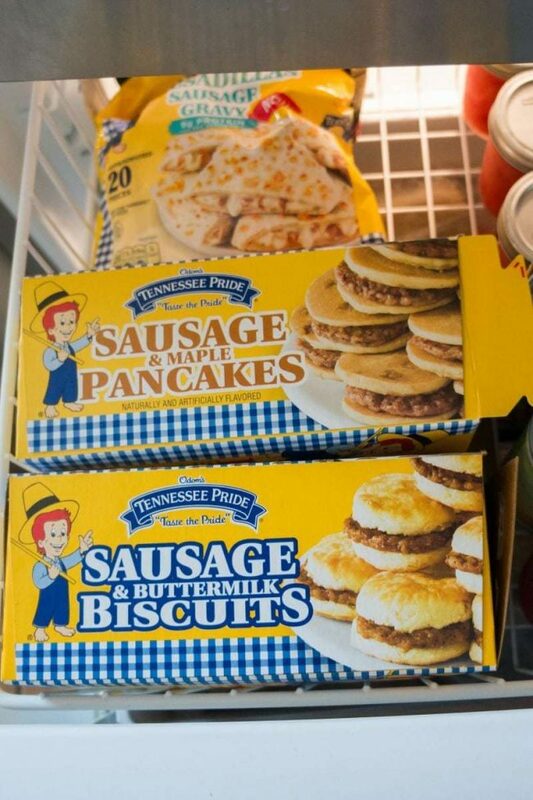 I need to get these sausage biscuits for my son, he would love these! I love these hacks. I like the tub in the car idea. It will help keep things organized inside the car. I am jealous of your hacks!! Our mornings are brutal I need to try out the shoe buckets that would make a world of difference for the girls! These are great! I will have to try them out! It helps to be prepared! Especially when readjusting to a school schedule! If only I had these tricks nailed down 7 years ago. I love the school clothes bin idea! Back to schol hacks are always nice. We always plan outfits, but never thought about organizing them in the drawers like that! How neat! I absolutely love the idea of the morning clothing bins. My son has OCD and it takes him forever to choose his clothing. These are all great hacks. I will have to get some baskets so i can organize the drawers. We get as much done as we can the night before so we have less to do in the morning. Love the idea of using organized bins for clothing! What a great way to let your kids pick their clothes without having them go to school in pj pants. I love all these hacks! 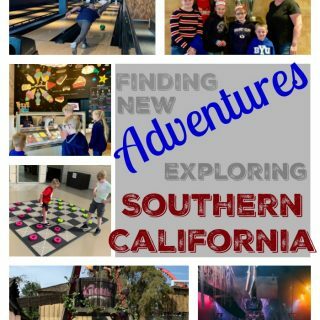 I also love that plaque you have with family time! That is such a great idea! I will be stealing a few of these myself! I love the hack of having the treats all ready in the bag! What a time saver, and the outfits in the bins are genius!!! I love the individual clothes baskets in the drawers, that would definitely make mornings easier without having to search for everything! The backpack station is also a great idea and could include purses/diaper bags/coats if needed all in the same area. Ready-made snacks can be a lifesaver in preventing meltdowns! Thanks for sharing your hacks!